Instructions: Cut white cardstock to 12 x 6" size, score and fold at 3 and 9". Stamp the daisy border from HCPC-3853 Patchwork Daisy Border set in Sky Blue Archival ink onto front flaps of card as shown, making sure to have the solid wavy line of borders facing the edges. 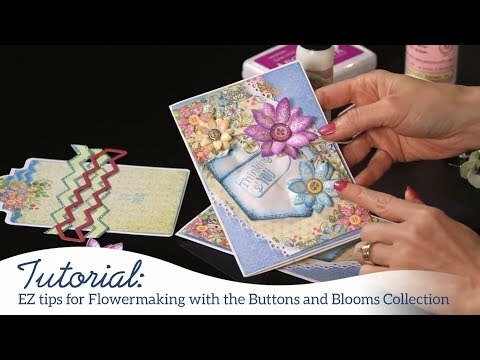 Use the coordinating die to diecut the borders. Use from the HCD1-7210 Eyelet Border Basics to diecut 2 coordinating decorative borders. Stamp the background from HCPC-3854 Hand-stitched Background set in Vivid Chartreuse ink onto both sides of card. Also, randomly stamp the circle sentiment from HCPC-3845 Just For You Sentiments in Sky Blue ink across stitched pattern. Cut a 6 x 6 " panel from within the paper collection to 5 3/4 x 5 3/4 " size. Sponge edges of panel with Sky Blue ink and attach to the inside of card base. Attach decorative eyelet borders alongside coordinating daisy borders and trim off excess edges. Stamp 2 medium and 4 small button flowers from HCPC-3849 Buttons and Blooms Cling Stamp Set in Sky Blue ink onto white cardstock and diecut with coordinating dies. Stamp the set of buttons 4x in Garden Patina ink onto white cardstock and diecut with coordinating die. Stamp the circle sentiment 2x from HCPC-3845 Just For You Sentiments set onto white cardstock in the same color ink. Diecut the sentiments by pairing the 2nd and 3rd smallest die from the HCD1-7155 Circle Basics Large Die set. Stamp the 2 small sentiments shown, in same color ink and diecut with the 3rd smallest circle die. Using the same die, cut another 2 circles from white cardstock and 2 from clear cardstock. Use the Stack and Store daubers along with the following inks to color. Use the Sky Blue ink over the border daisies and daisy petals. Use Vivid Chartreuse on the leaves and buttons. Sponge the inner and outer edges of 2 sentiment circle borders with the Garden Patina ink. Use the stylus from the HCST1-401 Deluxe Flower shaping kit to shape the daisies, leaves and buttons. Layer daisies onto both daisy borders and place buttons in the centers. Layer sentiment circle borders onto clear cardstock circles, then onto sentiment circles, and finally onto the extra cardstock circle for dimension. Attach both onto card as pictured. Apply some Dries Clear glue onto yellow hydra sponge, dab over decorative borders and sprinkle with Crystal glitter. 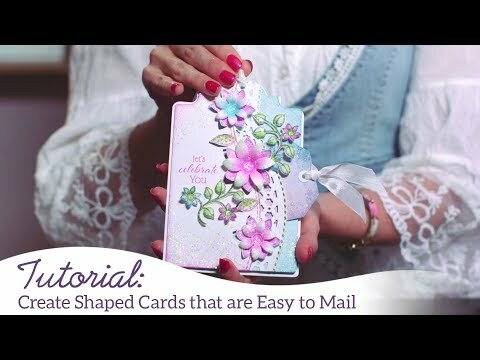 Use fine lines of Dries clear glue along with Crystal Glitter over daisies, leaves and rest of card as desired. Add some Crystal Lacquer to the button centers of daisies and let dry.